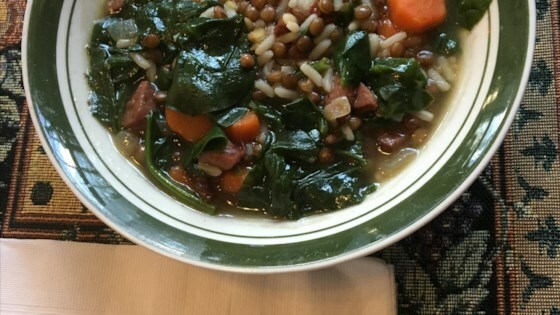 "Turkey kielbasa, spinach, and lentils are combined to yield a hearty soup." Very tasty. I didn't understand the rationale behind cooking the rice separately, so I just added it with the lentils. Also, I reversed the amount of broth and water. Hearty and healthy. This was very good. I did use all chicken broth instead of the water. And I used baby spinach so I was lazy and didn't tear it. Thanks for the recipe.